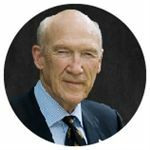 After graduating from Cranbrook, Alan Simpson attended the University of Wyoming, where he graduated in 1954. He served in the Army in Germany from 1955-1956, and then returned to the University of Wyoming to earn his Juris Doctor degree in 1958. He recently gave a very moving eulogy for President George H. W. Bush, which can be seen here.